Here I am with random updates. I haven't had anything to blog about recently, so I just stayed away and did my own thing. Did you notice that I didn't apologize? I've heard that you're supposed to say "sorry" to your readers if you copped out of posting for a certain number of days (e.g. 1). I say Bah! to that. I was busy swimming. And I baked cornish pasties, which took two whole days. Also shortbread. And I was painting. And procrastinating. I've actually been meaning to write this post for a while but I wanted to procrastinate on that. What fun! All this time I thought procrastinating was limited to just sewing and cardboard. Now I've discovered I can procrastinate on blogging, too! What a versatile bad habit! I love all your Bad Days stories and superhero costumes, capes and shirts. Reading about them gave me definite Good Days vibes. Thank you, friends! And hang in there, if you're in a Bad Day funk right now- as they say, "This, too, shall pass". Since I've been asked, here's the tally. The bags were sold within hours, thanks to you wonderful folks! I have no bags left (except the one I made for myself). Samaritan's Purse gets $415.00 and I'm feeling very humbled and yet proud that I get to contribute to their awesome work by selling things my hands made. It blows my mind. Thank you all for your generosity! You've actually written/hinted about wanting to see what costumes I'm making this year! I haven't started! Remember how I procrastinate every year until the week before? And then finish my costumes several days after Halloween itself? Well, the plan is to keep to exactly the same pathetic modus operandi in 2012. Why change something that clearly doesn't work but is such a comfortable rut to be stuck in? I will share, though, that so far, the girls are swaying dangerously towards the wretched princess/fairy thing again. They tricked me with that whole ungirly archery party tangent. They still want gowns and sparkles and rainbows and wings and ....ahhhhhhh! More of the same for Halloween!!!!! I surrender. Just to make it slightly fun for me, however, I think I am going to introduce fake corsets. Last week I was in JoAnn looking for zippers and found myself in the fleece aisle, checking out costume raw materials. Flabbergasted because this was me being uncommonly efficient and plan-ahead-ish. Successfully removed myself to the aisles containing useless and generic notions instead. Also people have also written to ask if I will sell them the costumes I've made for my girls, if my girls have outgrown them. Alas, no. I will never sell those dresses. Even if they are outgrown, the girls are still using them to play Dress Store aka Boutique. And they still doggedly squeeze into them if they can. Those dresses are much loved and we plan to keep them for as long as the moths will let us and someday hand them down to our daughters' daughters, if we are so blessed. And this is the real reason Halloween gets the rush treatment every year. Jenna has some charmingly unrealistic ideas for her 2012 party, including a papier-mache ("Not cardboard, Mom, because that's not waterproof but papier mache is!") pinata that, when a string is pulled, dispenses actual water, not candy. It's taking us a while to steer her towards a workable theme because Jenna is a person who knows exactly what she wants and who will tell you, "Hrmph. My ideas are better than yours". Once we have a workable theme, we can get started on party prep and then maybe the Halloween costumes will have a chance to see fruition. Almost a month into the start of the school year, I've finally conceded that the girls need hoodies. Well, Jenna needs a new zip-up reversible hoodie and Emily needs pullover fleece hoodies and maybe an upgrade on her old zip-up one. I've got the fleece and I scribbled their measurements on the back of a store receipt somewhere, so I really have no excuse not to get started. I might even sew them beanie-type hats if I feel a particular need to avoid starting on the H. costumes. I've been painting late into the night the past couple of weeks. I'm almost done with the project I was telling you about here. Who would've thought I'd finish it before Christmas? Painting is so therapeutic in ways that sewing will never be. I will share photos soon. I've been making bibs. It's dreadful. Not because I've gone and reverted to an old obsession but because I take them everywhere with me. It makes me look like a weirdo. And everyone asks me about them. Which is awkward because I generally dislike talking about sewing projects with other people. For one, what faster way to lose credibility as a sane human being than to tell people I make chickens and pigs that perform suspicious bodily functions? There are times I wish I could say, "Oh, I quilt." and look superior. Nobody would bat an eyelash at a response as regular as that. For another, I don't sew because it's a thrilling hobby I'm excited about - I just sew. I'd much rather talk about swimming or music or the state of the education system or ways to stop bullying in schools or whatever. Case in point: yesterday at the pool watching the kids at their lessons, a lady came up to me and asked me if I was selling my bibs at craft fairs. Horrified. Managed to choke out, "No!" and then felt compelled to explain, lest she think I was being selfish and hoardish of my bibs. Eventually got her to understand that I am useless at craft fairs and I only sell random odds and ends in an online shop and that the bibs were a gift for a friend having a baby. She left happily with a smile and an encouraging, "Well, you're doing such a good job with those bibs!" I should've just tinkered with my iPhone like all the other moms at the poolside. Oh wait, I don't own an iPhone. That's why I was viciously shoving a dowel into shapeless masses of fabric for entertainment. While sporadically looking up with random vocal explosions of "Go, Emily!" and "You can do it, Jenna!". No wonder people think I'm bonkers. Finally, there's that doll. Emily made her. Or, more precisely, Emily made most of her but I did all the fiddly curved bits and attaching of arms and legs. This is not a child's project. 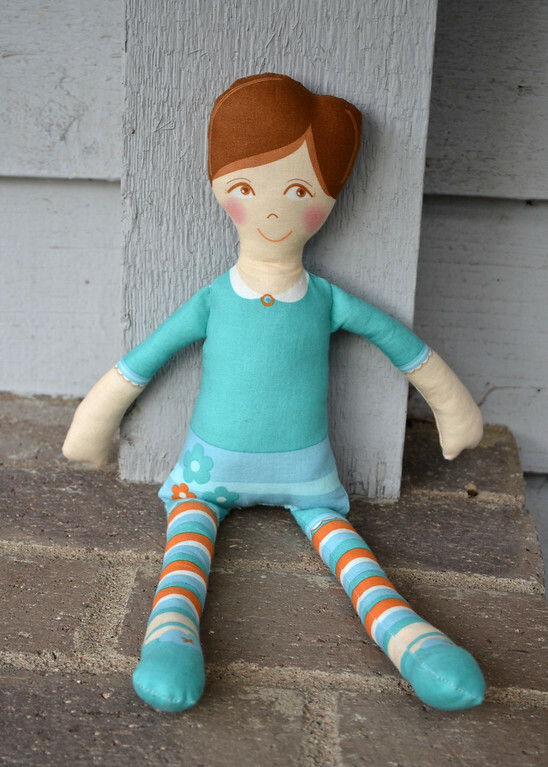 Particularly capable children might be able to sew those tight curves around the feet, hands and hair but they won't be able to attach the stuffed limbs to the inside-out torso while said limbs are also simultaneously stuffed upside down into the unsewn neck which then has to be sewn around those limbs. I don't even think some adults could do it. Still, it's a truly adorable dolly and Emily is very pleased with the outcome. We'll work on the clothes later. So that's what my October is looking like. Not relaxing at all. But exciting. Bring it on! I feel that way about knitting. I knit in public, but if the questions go beyond, "What are you making?" I wish I'd been reading a book instead, because I would rather discuss the book I'm reading than the yet-another-hat I'm knitting. I wonder what activities Jenna is participating in that she needs a reversible zip up hoodie for! ooh, I'd almost forgotten about those bags. Can't think what project they would be a part of, especially with painting thrown in! I think that it must take serious procrastination skills to make Cornish Pasty making last 2 days. Hmm, that might have to be for dinner sometime this weekend. Halloween costume making: well, the kids have picked their ideas. No motivation has been felt on my part yet - I think that I need the deadline to be looming more threateningly. Hey Dawn! Ah, Cornish Pasties - Day #1 to make the filling and day #2 to make the pastry and bake. In between that, realize one has run out of ingredients for pastry so try and call husband on his cellphone to have him pick up ingredients from supermarket on his way home from work but phone was on silent mode so no ingredients, then had to drive out myself to buy ingredients and while in supermarket might as well shop for the week's groceries and when finally home realize it's way past dinner time already so force everyone to eat and then continue pasty-making late into the night. So...... not so much procrastination as unbelievably poor planning and luck. In other words, inefficiency by any other name is still as insidious. And speaking of inefficiency, I'm with you on looming deadlines being the only cure. Good luck on your costumes! I know I'll need that for mine. Ugh. ...look forward to seeing your October projects come to life! oh, you make me laugh! You are a clever writer. And thanks for the update on the doll fabric. I was thinking of getting some for G as an easy sewing project. I can see that I will need to explain it as advanced sewing. We will start with lunch pail napkins, my original plan.